At the end of February I was the lucky winner of a 3-month Dollibox subscription after entering a competition via Twitter. I was really chuffed to win as I'd been wanting to try Dollibox for some time but funds wouldn't allow me to sub to another box. 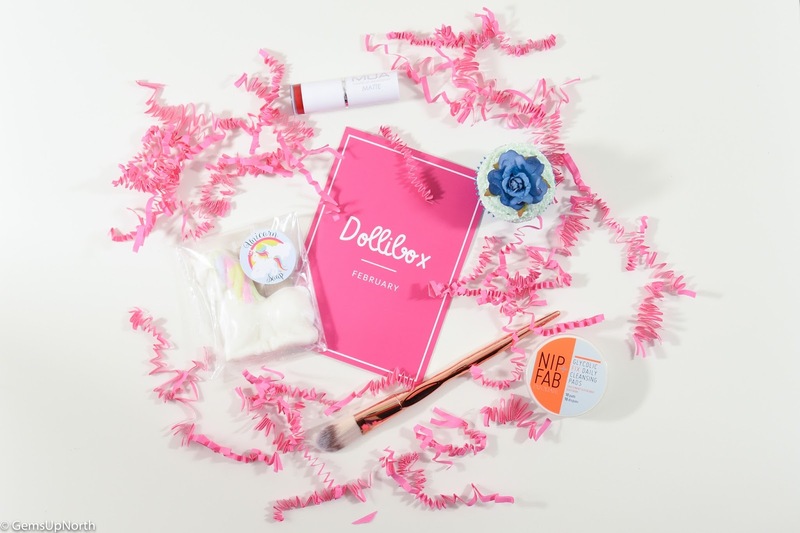 Dollibox is a monthly subscription box that includes 5 full size items and/or deluxe sized products. The contents is always a surprise just like other sub-boxes but knowing your getting full size or deluxe size items really makes this box good value for money at just £10.00 plus P&P per month. Each month the products come packaged in a branded postal box with paper shavings to keep the items safe and a product information card is included so you can learn more about each product you receive and see where to buy them from in the future. I actually really like that Dollibox comes just in the postal box and not with another box inside, I have a pile of beauty boxes from other subs because I don't like throwing them away, I don't have this problem with DB. I received February's box first which I was super excited about especially with the unicorn soap from Dreamy Bath on Etsy inside and I'm a sucker for collecting makeup brushes so was pleased to find a new foundation brush in the box from Pro-Range Professional; the gold handle fits nicely into my hand and the bristles are super soft. Also featured in the box was a deluxe sized tub of Nip & Fab's Glycolic Fix cleansing pads which I've become a super fan of after trying them a while back, I'm happy to have a travel tub now. A matte lipstick from MUA Cosmetics, a brand I use often was also included and its a lovely go to red shade. The last product made the whole box smell amazing, it was a bath bake melt from Miss Patisserie in the shape of a cupcake and almost looks too good to use. For my first box ever from DB I was really impressed, the delivery was smooth, the contents were secure and I have used every item featured. My second box from Dollibox arrived during the middle of March, this box was worth over £50.00!! Wow! I wasn't expecting my box the day it arrived as I wasn't familiar with when DB was dispatched, this box and the April box were delivered by Yodel and the first box was sent via My Hermes for anyone that wants to know. Again my box arrived with a lovely scent to it and that was the Scent Circus Unicorn Poop wax melts which smelt fruity and sweet; just as you'd imagine an unicorn's poop to smell, right? I was really happy to find a animal themed face mask from Bioaqua inside the box and I had lots of fun wearing the mask and snapping selfies. The Adamma Fibre Lash Extender mascara was the most expensive item in the box worth £39.99 and was a 2 part product, one wand adds fibres to your lashes the other coats them with mascara, quite a neat product in my opinion. Have you ever seen a cuter eyeliner? This Lamella Lucky Doll liquid liner is unsmudgeable but a little hard to remove and the final item a travel sized Palmer Coconut Oil body lotion which will be coming with me on my over night stays during the year. As an added extra there was tea bag inside the box too this month. I think my second box from DB was just as good as the first and had some really fantastic items inside. My third and final box arrived much earlier than the other two boxes and was delivered on the 8th of April. This box also surprised me with having 6 items inside, all of which are full size! I really think DB is good value for money especially after the full size items I've received in the past 3 months. This month also had a hair accessory and not only beauty items, the pom pom hair tie is one of my fav colours and doesn't get in the way when being worn. The Ard as Nails polish is the perfect shade for Spring being a mint green and is 5-FREE meaning it doesn't contain any toxic chemicals. The Saturated Colour lipstick really compliments the nail polish and again is a great shade for spring plus adds that pop of pink to my lips smoothly. There was a bath bomb from SkinJAM cosmetics featured this month which again gave the box a sweet smell even before I opened it; I really like the pattern on this bath bomb and I think its great that small Esty shops are featured in Dollibox. The Schwarzkopt Bonacure Fibre Force shampoo is a very welcomed product as it helps damaged hair by restoring it from within; my hair can get really damaged especially after colouring. Although the Baby Bear makeup sponge is a full size product I was a little confused as it looks like it should sit onto of a product and not alone but I will use it to apply loose powder none the less. Another packed full box with lots of goodies to try and I'm really happy the polish and lipstick especially. I've picked out my favourite items from the 3 boxes I've received and I'm not ashamed to say the 2 unicorn themed products made it into the top 4 but if you know me, you already knew that would be the case. I really liked the Bioaqua face mask, not only because it had a panda's face on it but it left my skin feeling refreshed and nourished. The grey pom pom hair tie had to make it into my favourites because look at it, so cute and who doesn't love a pom pom. The unicorn soap has taken pride of place in my bathroom and mainly to be on show and not to use because I don't want to ruin the design; it's making my bathroom smell lush though. The wax melts again can just be left and the scent will fill the room but melting them creates the sweetest smell and its gorgeous, I will be purchasing some more of these for sure. Thank you to Dollibox for running such a fab competition and for sending me the 3 month sub of Dollibox as my prize. 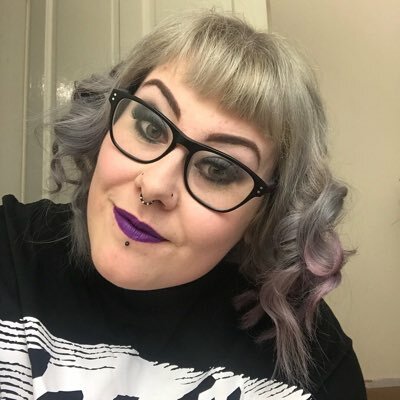 I've truly enjoyed receiving them and trying all the products, most of them were new products to me and new brands so I've been able to discover some new favourite brands along the way too. As soon as I am able I will be looking at signing up to Dollibox and receiving a box each month, I think it will be very popular on my blog too.